This unique book places emphasis on the understanding of the material presented by adopting a reflective approach towards the scientific method used. Knowledge of algebra, geometry and trigonometry is required however, the authors introduce more advanced mathematical methods in the context of the physical problems which are used for analysis. Modern physics topics, including quantum mechanics and relativity are introduced early and are integrated with more "classical" material from which they have evolved. Michael Mansfield is a professor in the Department of Physics at University College Cork. Professor Mansfield was awarded a BSc and a PhD by Imperial College London and a DSc by the National University of Ireland. He has held research and teaching appointments at universities and research institutes in Italy, Germany, UK, and Ireland. At University College Cork, he heads an atomic and molecular/plasma physics diagnostics research programme. He has published more than 60 research and review papers in this area. He is a member of the Institute of Physics and the Irish Fusion Association. Colm O'Sullivan is Associate Professor in the Physics Department, University College Cork, Ireland. He was educated at the National University of Ireland and received his PhD at the Catholic University of America, Washington DC. His research interests include cosmic ray astrophysics and physics Education. Professor O'Sullivan is also involved in the EU Leonardo da Vinci 2. The main objective of the ComLab project is to integrate different tools in science and technology teaching. 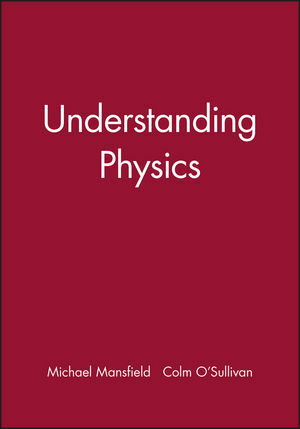 He is co-author with Michael Mansfield of the textbook Understanding Physics published by Wiley/Praxis.